Hear what Agents are saying! - S.E.C.R.E.T. Want to know what people are saying about S.E.C.R.E.T.? Hear it first from the agents who’ve completed a mission! My daughter had her 11th birthday party there and it was amazing. The staff was super attentive to details, professional and totally hands on. The party room was nicely decorated with the balloons and her birthday sign made for a great personal touch. I didn’t worry about anything as my daughter and her friends completed the SECRET mission. The ladies who worked in HQ were awesomely sweet and helpful to the girls during the mission. The birthday Discovery Guide, Kevonte was amazing, he said sit back mom and dad, and I’ll handle everything and he did. My husband and I were blow away to the professionalism of the entire experience. My daughter and her friends had a wonderful experience!! I can’t brag enough about how awesome this Children’s Museum is! The newest S.E.C.R.E.T. installment is going to get your kids really going. The S.E.C.R.E.T. spy missions gets the imagination going and is an interactive game that makes you feel like you are a real spy in the movies. The whole encounter really helps set the mood the moment you enter the Top S.E.C.R.E.T. area. They have a Top S.E.C.R.E.T. location for your kids to enter into so they can be transformed into a spy and make their S.E.C.R.E.T. agent code name! The lobby is full of all of the SPY X products that you can purchase, which was awesome for me because I had to order a lot of the same products online last year for my daughter. This whole experience had my family excited to do our next mission… This activity allowed my third grader a chance to problem solve, read, comprehend, continue to learn new things and most of all have FUN. It is expensive, and in my opinion, worth it. My kids (ages 7 and 9) completed all six-missions over the course of three days and I’ll share our experience. It cost about $100 ($20 initial, $10 each mission thereafter and $5 for each completion pin). We are members, so I didn’t incur that cost each day. 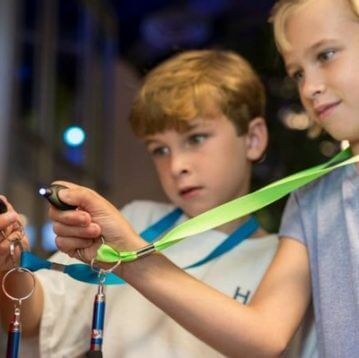 The initial cost is for the wristband that assigns a code to each family. This wristband allows the agents to access the mission stations all over the museum and tracks your progress through each mission. Several children can be agents under one purchase. The first mission took about two hours as we figured out how to follow directions, focus on a task, pay attention to detail and work as a team. My kids were forced to follow directions, focus on a task, pay attention to detail, use math and deduction, decipher codes and patterns, convert normal items into spy gear, worked as a team and were rewarded at the end by the computer. They’re still talking about it and are using the gear to create missions at home. Kids had a great time – ingenious different activities for the kids to being you back like Kidtropolis and S.E.C.R.E.T. Kid spy missions. Don’t forget to review and share your experience with us!